A squirrel cage blower, also known as a centrifugal blower, is used to move air and gases in a variety of applications. This equipment is so named since its construction looks similar to that of a hamster wheel. These types of blowers use kinetic energy to increase the velocity and capacity of the air stream; thus differentiating them from positive displacement blowers, which use mechanical energy to physically move the air from the inlet to the outlet. At the heart of the squirrel cage blower is an impeller, which is a circular or cylindrical mechanism with a series of curved vanes. As the impeller rotates, the air surrounding it also rotates at the same speed. This action imparts a centrifugal force to the air, causing it to move radially outwards to the walls of the blower or fan housing. The air follows a spiral trajectory – increasing in pressure and velocity – until it exits the discharge end of the blower. Squirrel fans are known for their superior energy efficiency compared to other types of blowers. They are also durable, reliable, relatively quiet, and capable of operating in a broad range of environmental conditions. These attributes make squirrel cage blowers a highly desired device in the HVAC industry. Indoor air circulation is an essential component of HVAC systems. This operation helps removes unpleasant smells, controls moisture and temperature, and introduces external air to prevent stagnation. Squirrel fans are a critical component in these distribution systems. When used in combination with heating systems, squirrel fans can be used to deliver a controlled stream of air to accelerate the drying of several products, including grains, processed foods, painted surfaces, and timber. The high efficiency and low noise characteristics of small squirrel cage blower fans are frequently used in environmental chambers to regulate parameters such as humidity and temperature. Squirrel fans are commonly used in the removal of potentially toxic and hazardous fumes. This is essential in many industries to maintain a safe working environment. 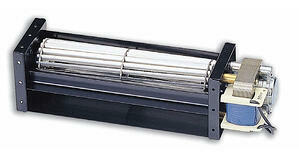 These fan systems are preferred to other types due to their efficiency and adjustable output. One of the most critical components of the typical squirrel cage fan blower is the bearings. Bearings help direct the movement of the impeller axle and help to reduce abrasion and resistance which can significantly decrease blower efficiency. It is therefore crucial that bearings are well lubricated and appropriately designed to minimize friction. The fan blade design is another factor which can determine the performance of these types of blowers. Multi-blade configurations consist of an arrangement of several blades around the impeller. This gives the impeller a greater surface area, giving it the ability to impart a higher centrifugal force to the air in the housing. The efficiency of multi-blade impellers is further affected by other characteristics such as shape, angle, and the number of blades. Harsh environments, such as corrosive atmospheres, can also damage both static and moving components, which can increase the required energy input and reduce airflow performance. It is therefore necessary to adequately protect the blower equipment to ensure that is capable of enduring such environments. Pelonis Technologies, Inc. provides a broad range of large to small squirrel cage fans for a variety of industries. To find out which of our solutions are best suited for your application, feel free to view our products.